At cornerback the Cowboys currently possess Orlando Scandrick (coming off major surgery), Brandon Carr (hasn’t had an interception since 2013) and Morris Claiborne (gigantic bust as the former No. 6 overall pick). In other words – to those of us who consider Byron Jones ultimately as a safety – yes, they’re desperate for help. And apparently they’re about to get it. The imminent signing of free-agent corner Patrick Robinson makes all sorts of sense out at Valley Ranch. Of course, at this point it’s not all that difficult to upgrade the position. After bringing in Nolan Carroll and Leon Hall, the Cowboys have reportedly narrowed their focus on Robinson. After five mediocre years in New Orleans as their 2010 No. 1 pick, he spent last season in San Diego where started 10 games and intercepted one pass. Again, impressive? Not really. An improvement? Yessir. 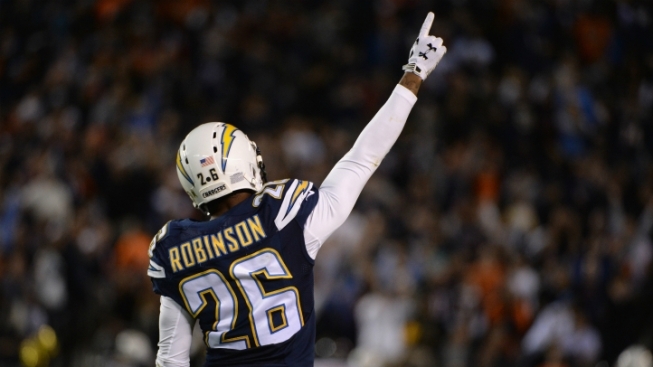 Bottom line: Robinson will be much cheaper than Carr. And – according to the current starter’s 36-game streak without a pick – he’ll likely be better. Even better, Robinson’s arrival will create leverage and allow the Cowboys to pressure Carr into signing a new, decreased contract. He’s set to make $9 million next year, while the going rate for a free-agent corner is around $5 million. His bang-for-buck ratio is ridiculously out of whack. Robinson is 28, healthy and the perfect fit for the Cowboys right now. On the depth chart. And at the negotiating table.